When spinning stories, some writers prefer to play in a sandbox. For writers at Marvel and DC, that sandbox is a long-standing universe, slightly off-kilter from our own, pre-populated with characters waiting to have their stories told and retold. For Evan Dhm's series of webcomics, Rice Boy, Order of Tales and the currently running Vattu, the creator decided to build his own sandbox in the disk-shaped planet of Overside, which includes a populated "top" half and a plague-ridden "Underside" that are populated with bizarre creatures and thousands of years of history. But while all of Dahm's comics take place in the same universe, each one tells a very different type of story that lets Dahm contribute to the lush and ever-growing density of his world.Rice Boy is the first and trippiest of Dahm's comics, and serves as the best introduction to Overside, largely because it's written as a surreal journey epic. The titular Rice Boy is a simple creature who is uprooted from his mundane life when The One Electronic, an immortal Machine Man whose face is a flickering black-and-white television screen, suspects the Rice Boy might be the Fulfiller of an ancient prophecy T-O-E has been searching for. Once Rice Boy has been convinced to leave his home, h journeys across one of Overside's vast continents, encountering all sorts of bizarre people and critters, and gradually comes to learn the truth of the prophecy and the one who will ultimately fulfill it. Dahm conceived of Rice Boy as an exercise in surrealism, and the comic is best enjoyed on those terms. Rice Boy may be our protagonist, but he's no hero, passively whisked through the lands of Overside, carried through mostly through the strength and kindness of others. Dahm loves to play with storytelling conventions, and there are light twists on the nature of prophecy, the lines between good and evil, and quests for vengeance. But the real strength of Rice Boy lies in its dreaminess. When we meet a frog woman in sentient cowgirl boots or a monster with a glowing mouth who has been nailed to the earth, we're offered no explanation, but are asked instead to accept these circumstances and drink in their strangeness. There are a great many clues to the larger mythology and cosmology of Overside, but it's enough to experience Dahm's character designs and gorgeous colors, and get swept up in the grand, but half-hidden scope of the story, much like Rice Boy himself does. Order of Tales, meanwhile, is a more straightforward high fantasy epic. It is set 400 years before Rice Boy, and also features The One Electronic, but it isn't precisely a prequel comic, no more than any remotely connected events in our own history can be said to be connected to one another. It is, aptly, a story about stories. Koark, our hero (who is, this time, an actual hero) is the only son of a member of the ancient Order of Tales, guardians of Overside's most important stories. When Koark's father is murdered by a rival, his final act is to bestow the title of Teller on his son and command him to find a secret story known as The Ascent of the Bone Ziggurat. When he encounters The One Electronic in a pub one evening, Koark realizes the ancient Machine Man might know something of the Bone Ziggurat. T-O-E sends him on an errand to an apothecary who might know something about the story. Instead, though, Koark finds himself at the center of his own story, one involving a Bottle Woman whose body contains a mysterious glowing liquid. Where Rice Boy is a reactive, surrealist tale, Order of Tales is much more of a classic hero's journey, one in which Koark must learn the value of his stories, and how to find the heroism in himself that goes beyond his trade as a Teller. But it's Dahm's current comic that might be the most ambitious of the lot. Vattu, which takes place before even Order of Tales, employs a more novelistic structure than Dahm's previous Overside comics. Vattu is a young girl born into a nomadic tribe, one that has long survived under a strict social and religious structure. But change is coming to their country, and Vattu is about to get an advance taste of that change. An empire is stretching itself across the continent, and the soldiers of that empire see Vattu's people as potential future farmers. When the nomads join the empire (clear on the point that they have no choice), they have no tax to offer, and instead offer Vattu, selling her into slavery for their temporary protection. Vattu is thrust into a life quite unlike the one she left behind, first among an empire contingent, where she befriends a strong and silent War-Man, then in the service of Morrian, the Double-Proxy Representative of the Emperor. There, Vattu has her first encounters the notions of a city and written language, and she attracts the curiosity of Morrian's superior, Calirus. 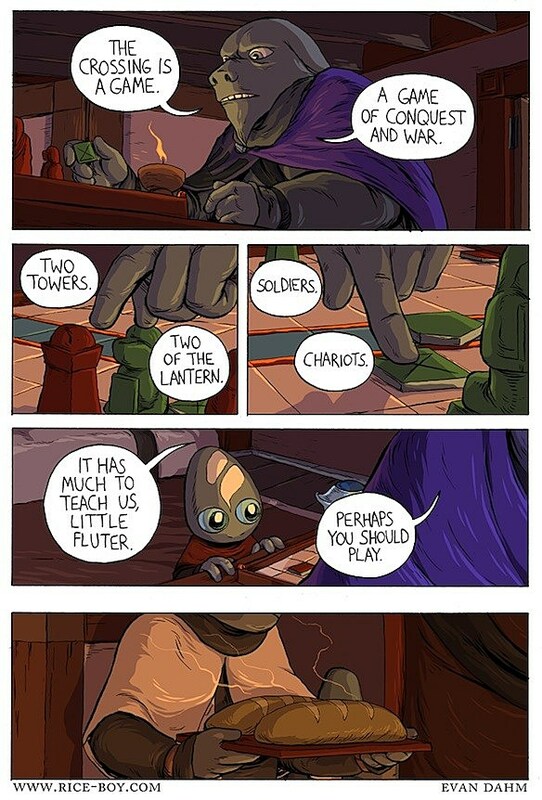 Because Vattu doesn't share the breakneck weirdness of Rice Boy or the clear epic clip of Order of Tales, it can come off as an interminably slow comic. In fact, it's one of the rare webcomics where I prefer to save up a chapter and then read it all at once. But when I do read it all in a sitting, it's clear that the slower pacing on Vattu is deliberate, there to give the emotional beats more space and to let Dahm stretch his artistic muscles and let his characters do a little silent acting. Gone are the grand prophecies and heroic destinies; instead, we get the more complicated politics of "civilizing" forces altering the fates of indigenous tribes, the resentment that can breed in small cultures, and the sometimes multifaceted relationships conquerors may have with their slaves. Thus far, Vattu has offered us a much narrower view of Overside, but a much richer story. You can even see that richness reflected in Dahm's artwork. Where Rice Boy's art is simple with an emphasis on colors to convey a sense of the world and Order of Tales's stark black-and-white artwork suggests engraved illustrations, Vattu's artwork is much better suited to character-driven narrative. His facial features and body language have developed a whole new vocabulary in this comic, bolstering his already strong character design. And his colors, while still brilliant, never threaten to overwhelm the rest of his world-building work. Hidden in all these stories, though, are larger mysteries about the nature of Overside. In each story, as well as in his short comics, Dahm offers questions and clues about Overside's nature and history. Hopefully, as he continues to delve more deep into Overside's past, he'll answer some of the most intriguing questions he's presented, such as why Overside and Underside were cut off from one another and how The One Electronic began his multi-millennial mission from God.